Previously known in the Asian film marketplace as The Blood Brothers, most likely due to the fact that it was influenced by Chang Cheh's 1973 movie by the same name, three years after its 117 day production wrapped, Peter Ho Sun-Chan's The Warlords has finally made its way to DVD and Blu-ray as part of Magnolia and Magnet's “genre-blending” Six Shooter Film Series. 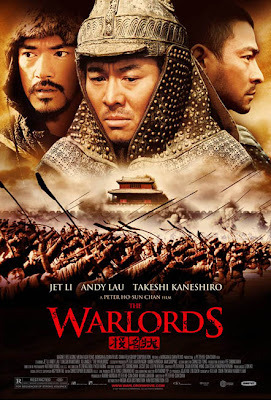 Recipient of the top prizes at both the Golden Horse and Hong Kong Film Awards in garnering Best Film, Director and Actor (for Jet Li), the sprawling epic Warlords is visually reminiscent of Braveheart in some of its elaborately staged battle scenes that feature hundreds of actors onscreen at one time. And while there's a love triangle worked into the plot for good measure, it's easily overshadowed by the power of the main ensemble that oozes testosterone in poisoned stares, questioning of egos and mental chess playing, which is later carried out to full effect in the thrill of warrior showdowns. 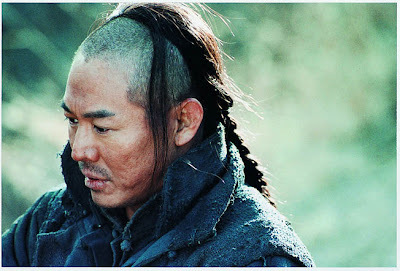 Set in the 1860s during the ongoing battles and political upheaval of the Taiping Rebellion, as the film begins, Jet Li's General Pang manages to survive a brutal three-day assault on his troops that killed thousands by pretending to be dead. Later riding into town and collapsing under the care of the lovely courtesan (Xu Jinglei) who spends a fateful night of passion with the wounded soldier, Pang later joins up with a duo of wandering bandits in House of Flying Daggers stars Andy Lau and Takeshi Kaneshiro's Er Hu and Wu Yang respectively. Becoming blood brothers, the three men defend a helpless village and later team up to rise in militaristic power that ultimately threatens to break their bonds of friendship, loyalty and brotherhood as Pang makes impossible decisions during the times of war and the men are tested morally and politically in their rise to save their country and people. Li continues to establish himself as a subtly powerful presence who can dazzle with understated grace under pressure before turning on a dime to challenge those who threaten the viewpoints or happiness of his character, particularly when he comes across the woman he'd fallen for later on as the lover of one of his blood brothers. 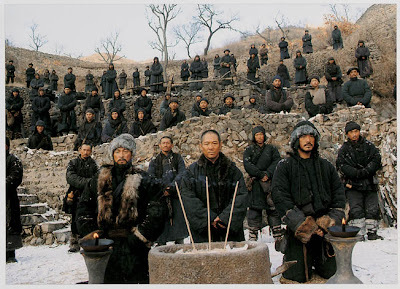 Nonetheless in Chan's film, the battle sequences and brotherhood usurp our attention from start to finish, therefore weakening the love triangle angle as well as – at times – affecting our belief in the strength of the men's dynamic. Needless to say, the epically staged action sequences make this film well worth tracking down as it will no doubt garner additional interest for fans of Li thanks to its American disc release. Yet even more than the traditional battles that feel molded on Braveheart, Warlords is particularly memorable for its heartrending sequence that finds Pang, Hu and Yang debating whether or not to use up their food or arrow supply on thousands of former rival soldiers who are then under their command. Boldly uncompromising in its depiction of the brutality of war and what it can turn any given man into, as a whole Warlords is a flawed film that could've benefited from stronger character development and a more clearly defined sense of time that's gone by as we're never sure how many years they've been battling etc. aside from passing comments. However, it's still a timely feature that tries to involve us in the overwhelmingly complex battle from a more personal point-of-view of these given blood brothers.